Oakley is a company known mostly for their high end sunglasses, football visors, and ski goggles. They also make watches, clothing, bags, backpacks, shoes, prescription glasses, football and hockey eyewear, and other accessories. 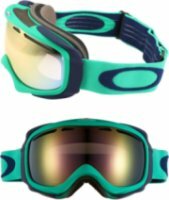 Oakley Splice Goggles - Snow goggle technology has been in a deep freeze for decades. Oakley is fanatics about everything to do with gravity, risk and snow capped peaks, and some of the greatest athletes on the mountain rely on our innovations. That’s why they tore apart the whole concept of goggles and reinvented them from scratch. The result is Oakley Splice®. To understand what they mean, you have to try on these goggles. Period. Oakley Crowbar Goggles - Long before it became a global leader in sunglass technology, Oakley was obsessed with inventing the world’s best goggles. Crowbar® Snow is the latest milestone of that 28-year obsession, and it takes goggle technology to the highest elevation of performance. Crowbar® Snow is the first Oakley ski goggle with struts to balance and distribute frame pressure for all-day comfort. We engineered the contact area to match facial contouring for a precise anatomical fit. Oakley Icon Backpack 3.0 - The Oakley Icon Pack has been around for more than a decade, and version 3.0 is the best yet. Introduced more than a decade ago, the OAKLEY ICON BACKPACK has been copied but never duplicated. To match its cunning efficiency and long-haul comfort, they added features that bring version 3.0 into the digital age — a holster for your mobile phone, a pocket for your mobile music player, an internal organizer for your PDA/GPS-size device, and more protection for your laptop. Oakley GB Insulated Jacket - Snow bunnies just stand around looking good. Snow foxes stir up performance with fashion, and they belong on the top of the food chain. This seductive predator is called the GB INSULATED JACKET and it’s from the Gretchen Bleiler Signature Series. Look beyond the snazzy seam lines, the cute faux buttons and the rich rivet highlights, and you’ll see it has everything you need to make the most of mountain recreation. 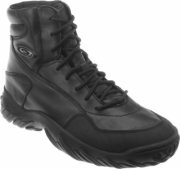 Oakley SI Assault Boot 6'' - Step up your urban operations in the SI Assault Boot from Oakley. Tongue is gusseted to keep out debris. Polyurethane in the insole and midsole acts as a shock absorber. The synthetic polymer outsole provides multidirectional tread for strategic maneuvers..
Oakley Stockholm Goggles - Hey ladies, this goggle is sexist. Ordinary goggles are shaped for the boys’ club of facial anatomy. Not Oakley Stockholm. Oakley started with the 3-D cranial geometry that gives Oakley women’s eyewear such a made-for-you fit. They applied three decades of goggle know-how and ended up with the most comfortable design a girl can wear. It just plain feels right. Until you try it on, you’ll have no idea what you’ve been missing. Oakley Flak Jacket - The Flak Jacket Sunglasses by Oakley - Sport professionals demand nothing less than the best, and we’ve answered their challenge for decades. World-class athletes have driven us to create innovation after innovation, including interchangeable lens designs with unbeatable optical clarity. FLAK JACKET takes that to the next level with the latest in performance technology. MAINTAINS SHARP, CLEAR VISIONFLAK JACKET sunglasses feature Oakley HYDROPHOBIC, a permanent lens coating that prevents rain and sweat from building up on the lens. Oakley Holbrook Polarized - The Oakley Holbrook Polarized Sunglasses are named after the small town of HOLBROOK found along historic Route 66 in Arizona that sits on the outskirts of the Painted Desert and the Petrified Forest. It’s a classic western badland that epitomizes a spirit of exploration and adventure. The Oakley Holbrook Polarized Sunglasses prepare you for anything the sun throws at you with its HDPolarized and PLUTONITE® lens material that filters out 100% of UVA/ UVB/ UVC & harmful blue light up to 400nm. Oakley Shelf Life Snowboard Pants Lightning Green - The Oakley Shelf Life Snowboard Pants are ideal for someone who wants a pair of functional pants without all of the distracting bells and whistles. These pants are perfect for both the snowboarder and the person who needs everyday winter wear for running errands or attending a causal get together. Features include a thigh vent zipper for optimal comfort and critically tapes seams for optimal movement and durability. Oakley Plaintiff - Oakley Plaintiff™ takes the time-honored aviator look to new heights with dimensional stem detailing and the mechanics of titanium Mono Shock™ hinges.0. The engineering was inspired by the leaf springs of performance racing machines and it allows the stems to hyper flex when necessary. That means this aviator can handle life’s turbulence, so it’s more than just a new take on a classic look. Aviators from the old days had flat lenses, so performance fell flat and style was two-dimensional. Oakley Goods Snowboard Jacket Aurora Blue - The Oakley Goods Snowboard Jacket makes a statement on and off the slopes. This jacket is a technical shell made with 100% polyester material. If you like to have your music while you shred the slopes, the Oakley Goods jacket has a media pocket. Snowboard, skiing or just looking great while on the town this jacket has style. With 10k of both waterproofing and breathability you know it's gonna keep you dry inside and out.